For those of you in the field of recombinant protein expression, you know that it is a powerful and growing technique in life science research. In order to stay at the forefront of structural biology and biologics development, one needs to keep updated on the latest advances and network with like-minded researchers. One of the best ways to do that is by attending conferences. Cost: from conference fees, to airfare, hotel, food and transportation, costs can really add up! Time away from research: conferences rarely fit in perfectly with one’s experiment planning, so finding someone to cover for you can be difficult. Slow or non-existent Wi-Fi: Nothing like trying to catch up on emails or get research results and not being able to connect. Communication barriers: having to ask the speaker a question in front of large group can be daunting. Nor is it easy to talk to a leader in the field without getting a little star-struck. 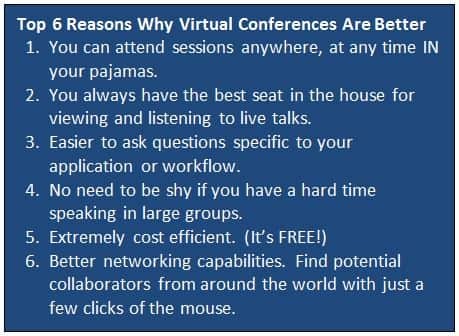 Cost and Time Efficient: Not all virtual conferences are complimentary, however you can attend this event for free. And there are no worries about lost time spent traveling, in traffic or being jet-lagged. Learn your way, at your pace: Exclusive to ExpressionWorld, attendees have the opportunity to learn new skills in our virtual lab training. If you want to do something over, there’s no one to complain. Attend live or recorded sessions with Q&A and earn continuing education credits. Gain immediate access to technical resources, handbooks and app notes you’re most interested in. More attendees and a wider global reach to network with: Due to travel and conference costs, it’s typically too expensive to send an entire lab team to a conference, especially to a conference on the other side of the world. With ExpressionWorld, everyone can attend, thus providing a much larger pool of participants for group discussions. Better for the environment: No travel needed (reduces carbon footprint) and download and print only what you need rather than throwing away brochures at the end. Therefore, if you are involved in structural biology or biologics development or interested in learning more about protein expression, this is a must attend virtual event. The complete Agenda and list of speakers for ExpressionWorld is online for you to review. Register NOW!